This tutorial shows you how to create GSON Annotations Example using JsonAdapter. The @JsonAdapter annotation is one of userful GSON annotations. This annotation be used at field or class level to specify the Gson TypeAdapter for serializing or deserializing. GSON converts java classes to JSON using its built-in type adapters by default. Sometimes, They doesn’t fit your specified requirements. So you can customize them by implementing custom type adapters. As you can see, the above Fruit POJO is annotated with MyCustomTypeAdapter using @JsonAdapter annotation. Above is a custom type adapter which extends TypeAdapter class and we simply overrides read and write methods. These methods are used for serialization and deserialization. These read and write methods are implemented with token based approach. During deserialization process, we read token and iterate over them one by one using JsonReader’s hasNext and nextName methods. One more thing, We must process opening and closing brackets using beginObject and endObject (or beginArray/endArray) methods. Notices that @JsonAdapter annotation can be used on both class and field level. In this GSON Annotations Example using JsonAdapter, we are using it on class level. And we will get same result as annotation usage. That’s it. 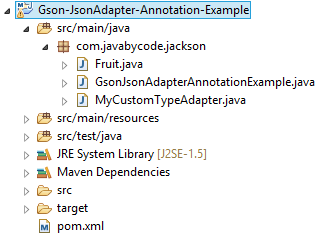 Hope that this GSON Annotations Example using JsonAdapter tutorial helps you create your own custom type adapter.